Boulder's central location on the Front Range of the Rocky Mountains affords quick access to numerous destinations. Rocky Mountain National Park is only an hour away. The little-known Indian Peaks Wilderness area is even closer. Colorado Springs and Pike's Peak can be visited in a day. We've detailed some popular day-trip destinations below. Estes Park, affectionately known as the "gateway to the Rockies," is a mountain town of 6,000 people adjacent to Rocky Mountain National Park. The town is busy and bustling in the summer; however, in the off-season, Estes Park becomes a quiet retreat. While you're there, stroll along the riverwalk with its various cafes and restaurants. Slightly outside of town on the peak-to-peak highway is Lily Lake — a beautiful summer spot for a family walk and picnic. If you're seeking a cup of coffee in town, try locally-owned Kind Coffee or the nearby Starbucks riverfront patio. Be aware that large herds of elk often wander directly into downtown Estes Park. Drive carefully! Rocky Mountain National Park is one of the finest parks in America. It's also one of the largest. There are three popular destinations within the park — all quite unique, and distant from the others. The highest part of the park can be visited by driving up the winding Trail Ridge Road. Near the Alpine Visitor's Center at the top, you can stroll along the Arctic-looking Tundra trail. While Boulder is wilting in July heat, temps on this trail will usually be in the 50°s. Bear Lake, at a lower elevation in the center of the park, is a popular place to stroll and picnic. The alpine views from the lake are lovely. The southern Wild Basin section of the park offers a selection of forested, gentle hikes. Other destinations for hikers and climbers include Lumpy Ridge, the Mummy Range, and towering Long's Peak. Fort Collins, located an hour north of Boulder, is the home to the University of Colorado's rival, Colorado State. Like Boulder, Fort Collins is a fun, outdoorsy, college town. Old Town Fort Collins is the historic downtown district, somewhat analagous to Boulder's Pearl Street mall. Slightly northwest of the city is the scenic Poudre Canyon — a place loved by hikers, climbers, and fly-fisherfolk. An hour west of Fort Collins is the tiny town of Red Feather Lakes, home of the Buddhist Shambhala Mountain Center (map). The recently-completed Great Stupa of Dharmakaya, blessed by the Dalai Llama himself, is worth a visit to the Shambhala Mountain Center. The Stupa is open to visitors from 9:00 am to 6:00 pm. The Indian Peaks Wilderness area is immediately west of Nederland (roughly 30 minutes west of Boulder). Administered by the National Forest Service, the high-alpine Indian Peaks feature some of the finest mountain scenery in the area. Brainard Lake, at 10,000 feet, is a great spot for a family picnic and stroll. The hike from Brainard to Lake Isabelle will reveal waves of wildflowers in the summer. Navajo, Apache and Shoshoni Peaks surround Lake Isabelle, and protect a small year-round glacier. Hikes to Blue Lake and Mitchell Lake are also lovely. To enter the Brainard Lake section of the Indian Peaks Wilderness area, you can follow the peak-to-peak highway from Nederland to Ward. See our hikes page for more detail. Summit County, located a few hours southwest of Boulder off of I-70, is most famous for its ski resorts. However, scenic Lake Dillon in the center of the county is a fantastic spot for summer outings and boat trips. The towns of Breckenridge and Frisco are fun destinations even in the skiing off-season. Breckenridge in particular hosts numerous summer arts and music events. You can explore hiking trails through the aspen trees above Dillon, and follow your hike with a drink at one of the independent coffee shops or brewpubs. Shoppers might enjoy visiting the factory outlet stores in Silverthorne. 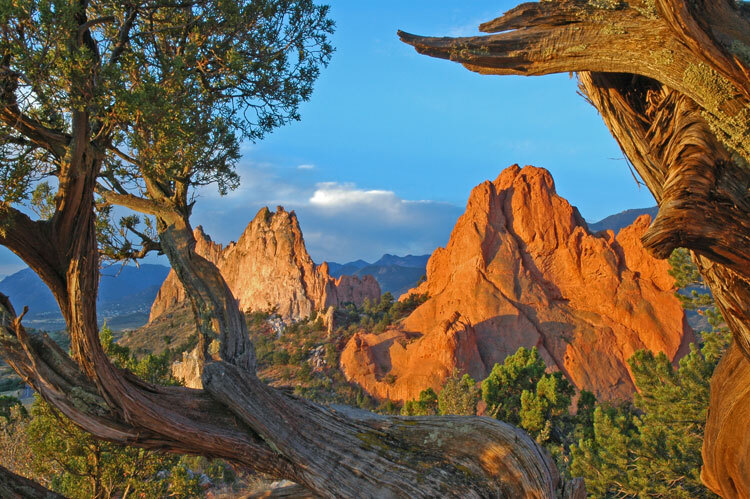 Colorado Springs, Pike's Peak, and the stunning Garden of the Gods park are approximately 1.5 hours south of Boulder. As the second-largest city in Colorado, Colorado Springs features many urban sights and sounds — including historical hotels and buildings. Outdoor lovers will enjoy the nearby Pike's Peak and Gardens of the Gods park. Pike's Peak is one of Colorado's "fourteeners," and the 14,110 foot summit is accessible by car. Garden of the Gods park is a unique public park with sandstone pinnacles. Hikers, bikers, and climbers will enjoy the views from among the spires.